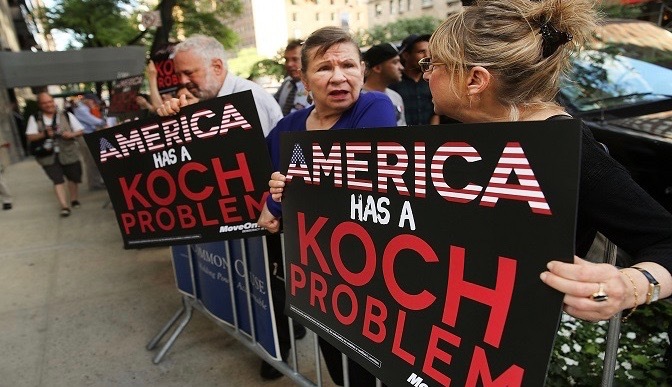 Americans for Prosperity (AFP), the dark money organization launched by Charles and David Koch, is the only one of more than a dozen nonprofits surveyed by MapLight that has refused to release a redacted Schedule B of its 2016 tax return. The schedule shows the size of donations that exceed $5,000. The Internal Revenue Service allows nonprofits to redact the names and addresses of individual contributors, effectively rendering them anonymous. IRS instructions explicitly state that nonprofit organizations must provide full copies of their tax returns, including a redacted Schedule B, to the public. AFP has argued that even disclosing only the amounts of contributions larger than $5,000 would allow the public to identify donors to the conservative organization. A document filed with the North Carolina Secretary of State’s office shows that AFP received more than 80 percent of its 2016 contributions from five donors; the individual amounts, however, can’t be determined without a Schedule B. MapLight, a Berkeley, Calif.-based money in politics watchdog, filed a formal complaint with the IRS earlier this month, asking the government to force the nonprofit to release a redacted Schedule B. The annual tax return that all tax-exempt organizations are required to file, known as a Form 990, can be a lengthy document. It can include as many as 16 completed sections labeled “A” through “R.” The Form 990 reveals how much money an organization raised; the amounts that came from contributions and grants; the identities of its board members and top officials; salaries for key people; and grants made to other organizations. Politically active nonprofits created under Section 501(c)(4) of the Internal Revenue Code are known as “dark money” organizations because donors can remain anonymous. The reason for donor anonymity stems from the civil rights era, when Alabama officials attempted to bar the National Association for the Advancement of Colored People (NAACP) from the state and sought its membership list. The U.S. Supreme Court ruled in 1958 that private organizations could keep their membership lists secret. Even without names and addresses, the Schedule B is useful for journalists. MapLight, for example, used a redacted Schedule B to reveal that the Wellspring Committee, a nonprofit organization that helped fund a $10 million campaign to push U.S. Supreme Court Justice Neil Gorsuch’s confirmation, received almost 90 percent of its 2016 funding from a single $28.5 million donation.